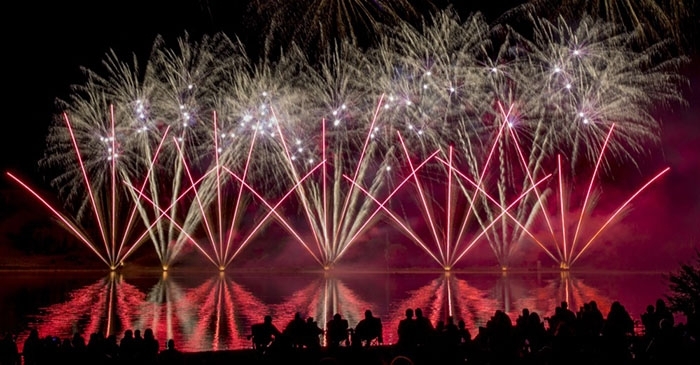 The 2017 Living Skies Come Alive International Fireworks Competition on the August long weekend was the most successful fundraiser in the history of Moosomin Regional Park, raising net proceeds of $150,000. Layne McFarlane of the fireworks committee said he couldn’t believe how much the event made after all the income and costs were calculated. “It’s unbelievable,” he said Thursday. “In other years we’ve had $40,000 to 50,000 at the end of the day. We’ve been pleased with that, but the total this year is just incredible. He said the plan is to continue with the annual fireworks competition. “We had a fireworks committee meeting, and the recommendation of our committee to the board will be to proceed with fireworks once again,” he said. Volunteers are always a challenge, McFarlane said. “Getting enough volunteers is always a challenge, and the larger the event, the more volunteers you require. He said he was happy to see the high attendance and the impact on the community. “Something that became very evident this year is the impact on the community,” he said. “Restaurants were busy, a lot of hotel rooms were rented, grocery stores were busy, and other stores were as well, and that’s a very positive spinoff of this event. The park had been earmarking proceeds of the fireworks for the water treatment plant. “It couldn’t happen at a better time for us, with the water plant that we’ve just entered into an agreement for,” says McFarlane. “We will spend approximately $650,000 to have the water plant developed, and we will put $350,000 down. “That $350,000 is an accumulation of net proceeds from the fireworks over the last eight years. Peter Palmer of CanFire, the Winnipeg company that represented Canada at the International Fireworks Competition, said he is happy to be associated with such a successful event. “I think it’s awesome,” he said. “It’s a win-win for everyone—for the audience that sees a great show, for the park to raise money. They can use that money for infrastructure now. Palmer has been competing at Moosomin Regional Park for more than five years. He said the word is getting out far and wide about the Living Skies Come Alive fireworks competition. Palmer says he loves his job and finds firing off fireworks more of a challenge than his previous career—flying a commercial airliner. “It’s a challenge every day,” he said. “I used to fly commercial jets and I left that to do this. “This is more challenging day to day by a factor of five or more. “After 10 years of flying jets, it’s the same checklist, the same thing over and over, it’s very routine, and you want it to be routine because you want flying airplanes to be uneventful.